Capt. Chesley “Sully” Sullenberger (15:26:37): Uh, what a view of the Hudson today. First Officer Jeffrey Skiles (15:26:42): Yeah. Skiles (15:26:52): Flaps up please, after-takeoff checklist. Sullenberger (15:27:07): After-takeoff checklist complete. (15:27:11.4): Sound of thump/thud(s), followed by shuddering sound. (15:27:13): Sound similar to decrease in engine noise/frequency begins. Sullenberger (15:27:15): We got one rol — both of ’em rolling back. (15:27:18): Rumbling sound begins and continues until approximately 15:28:08. Sullenberger (15:27:32.9): Mayday. Mayday. Mayday. Uh, this is, uh, Cactus-fifteen-[forty]-nine. Hit birds. We’ve lost thrust [in/on] both engines. We’re turning back towards LaGuardia. LaGuardia departure control (15:27:42): OK uh, you need to return to LaGuardia? Turn left heading of, uh, two two zero. (15:27:43): Sound similar to electrical noise from engine igniters begins. Sullenberger over public address system (15:29:11): This is the Captain. Brace for impact. Departure control (15:29:21): Cactus-fifteen-[forty]-nine, turn right, two-eight-zero. You can land runway one at Teterboro. Skiles (15:29:21): Is that all the power you got? [Wanna] number one? Or we got power on number one. Sullenberger (15:29:25): We can’t do it. Sullenberger (15:29:26): Go ahead, try number one. Departure control (15:29:27): OK, which runway would you like at Teterboro? Flight Warning Computer (15:29:27): Sound of continuous repetitive chime for 9.6 seconds. Sullenberger (15:29:28): We’re gonna be in the Hudson. Departure control (15:29:33): I’m sorry, say again, Cactus? Departure control (15:29:53): Cactus-fifteen-forty-nine, radar contact is lost. You also got Newark airport off your two o’clock in about seven miles. Enhanced Ground Proximity Warning system (15:29:55): Pull up. Pull up. Pull up. Pull up. Pull up. Pull up. Skiles (15:30:01): Got flaps out. Skiles (15:30:03): Two-hundred-fifty feet in the air. Ground Proximity Warning System (15:30:04): Too low. Terrain. Ground Proximity Warning System (15:30:06): Too low. Gear. Skiles (15:30:06): Hundred and seventy knots. Skiles (15:30:09): Got no power on either one? Try the other one. Radio from another plane (15:30:09): Two-one-zero, uh, forty-seven-eighteen. I think he said he’s going in the Hudson. Enhanced Ground Proximity Warning system (15:30:15): Caution. Terrain. Skiles (15:30:16): Hundred and fifty knots. Skiles (15:30:17): Got flaps two, you want more? Sullenberger (15:30:19): No, let’s stay at two. Sullenberger (15:30:21): Got any ideas? Departure control (15:30:22): Cactus-fifteen-[forty]-nine, if you can uh, you got, uh runway, uh, two nine available at Newark. It’ll be two o’clock and seven miles. Enhanced Ground Proximity Warning system (15:30:23): Caution. Terrain. Enhanced Ground Proximity Warning system (15:30:24): Terrain. Terrain. Pull up. Pull up. [“Pull up” repeats until the recording ends]. Sullenberger (15:30:38): We’re gonna brace. It was the bird strike heard around the world. Ten years ago, US Airways Pilot Chesley “Sully” Sullenberger averted disaster when a bird strike disabled both engines of his plane and forced him to land in New York’s Hudson River. All 155 people on board survived. The “Miracle on the Hudson,” as it became known, happened because a flock of Canada geese (Branta canadensis) flew into the plane shortly after takeoff from New York City’s LaGuardia Airport. Minutes later, Sullenberger made an emergency landing in the water. While pest management professionals (PMPs) aren’t viewed by all as heroes like Sully, they can still play a key role in protecting planes and passengers from costly — and sometimes deadly — bird strikes. About 14,400 bird strikes occurred at 700 U.S. airports in 2017 alone, U.S. Federal Aviation Administration (FAA) statistics show. Birds cause structural damage when they hit windshields or fuselages, and mechanical damage when they are sucked into engines. Although hunting behavior, hovering and soaring habits, flocking tendencies, migration patterns, and flying altitudes vary with bird species, nearly any bird can pose a hazard to airports. The need for wide-open spaces that accommodate long runways — and out-of-the-way locations on undeveloped land — make airports an ideal spot for birds to rest, roost and nest. Tall grasses, trees, shrubs, weeds and brush, as well as structures, provide the cover that bird species need to survive and thrive. Many airports are situated near bodies of water large and small, such as oceans, lakes, rivers, wetlands and drainage ponds. Birds have their pick of water sources. Food is plentiful, too, whether it’s the seeds, berries, grass, insects and other small animals found in nature, or discards from airport employees and patrons. Managing or eliminating the food, water and cover that bird species need to survive may help keep bird-related hazards under control, but will not eliminate them entirely. 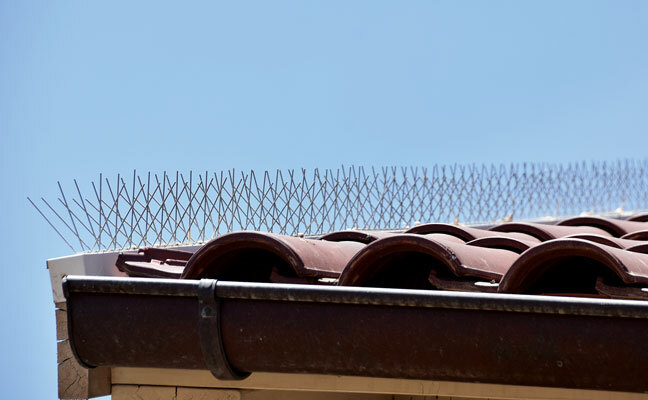 Bird droppings can damage property and equipment, and create health risks ranging from slips and falls to food contamination. Nesting materials can be a problem; when packed into high-heat areas they can cause fire hazards, and when blocking drains they can cause water damage. How can you deter pest birds from landing, roosting and nesting in airplane hangars, terminals, loading docks, roofs, ledges, signs, walkways and bridges at airports? PMPs should first determine what is attracting birds to the area, and then develop a strategy for control. Determine the bird species causing the damage, and then devise effective control methods based on regulations pertaining to the bird species. Often, airports are located along bird species’ migratory paths. For example, FAA data shows that the Kansas City International Airport, which was built along a bird migration route known as the Mississippi Flyway, had more bird strikes than any other U.S. airport in 2018, according to a report in USA Today. The airport, which had 127,449 annual flights, reported 16.48 bird strikes per 10,000 flights in 2018. The U.S. Migratory Bird Treaty Act (MBTA) limits the actions that can be taken against the bird species it covers. Passed in 1918 and updated periodically to include additional species and expand its reach, the MBTA makes it illegal to take, possess, import, export, transport, sell, purchase, barter or offer for sale, purchase or barter any migratory bird, or the parts, nests or eggs of these birds, except under the terms of a valid federal permit. About 90 percent of bird strikes in the United States are by species federally protected under the MBTA, according to Bird Strike Committee USA, an organization comprised of volunteers from the FAA, U.S. Department of Agriculture (USDA), U.S. Department of Defense, and the aviation industry. In addition to the MBTA, some bird species are protected under the Endangered Species Act of 1973, whereas some non-migratory birds are protected under state laws. PMPs have options, however. They may obtain permits if the birds are causing, or have the potential to cause, a serious threat to the health and safety of the public, and when non-lethal control methods do not solve the bird-related problems. The U.S. Department of Transportation, the FAA, and the USDA Animal Plant and Health Inspection Service (APHIS) are tasked with preventing bird strikes by issuing regulations and guidelines designed to minimize the occurrence. The FAA establishes rules for how birds and other wildlife are managed at certified airports; classifications are based on the air carrier operations they serve. To determine the species of birds and what attracts them to the airport and surrounding areas, a wildlife biologist trained in bird hazard assessment will conduct an ecological study. Depending on the potential for bird strikes, they may conduct a Wildlife Hazard Assessment (WHA) and create a Wildlife Hazard Management Plan (WHMP) that identifies the actions that will alleviate bird strike risks. PMPs can provide the bird management services called for in a WHMP (see “Bird control options” on p. 36). No permit is required for any bird species if harassment is the control method. Leone says the most common bird species you will find at an airport are pigeons, starlings, sparrows and geese. Blackbirds, crows, Canada geese, cormorants, grackles, gulls, house finches and vultures are among the other bird species frequently found at airports. Birds have been a problem since the advent of aviation. According to the FAA, Orville Wright reported the first bird strike in 1905. The problem not only persists, it is getting worse thanks to new turbine aircraft engines made with lightweight parts. Faster, quieter aircraft give birds less time to move out of an airplane’s flight path. Mid-air aircraft issues aside, the actual airport structures can be protected by PMPs. 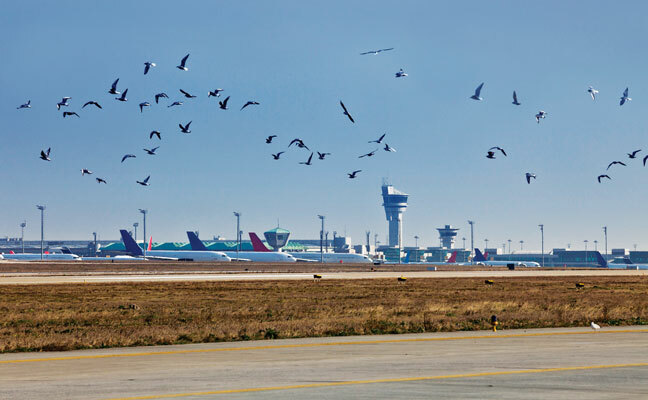 “They are an aesthetic issue, but can also cause damage to the buildings at the airport,” says Jeff Weier, technical director for Sprague Pest Solutions, Tacoma, Wash.
For bird control work at airports, certification requirements vary by state. “You typically need a business license and a license from the Department of Natural Resources or an equivalent agency, along with a license from the state’s Department of Agriculture or pesticide regulatory agency,” Livingston says. 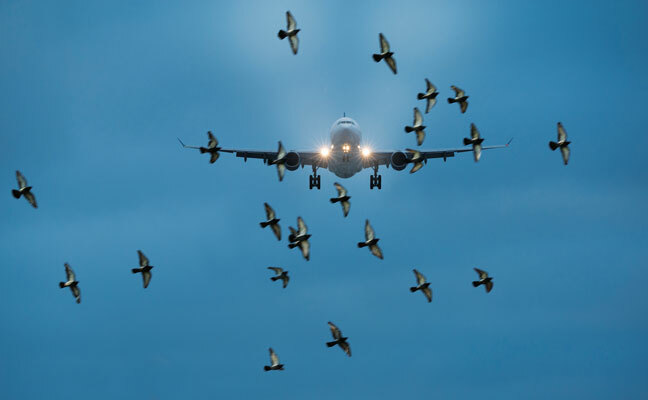 Pigeons, starlings and English sparrows are just a few of the bird species Weier encounters when performing bird control in and around airport terminals. He says PMPs may need a contractor’s license to install netting in some areas, although it depends on the jurisdiction. Proper identification of bird species is just one of many challenges with airport work. He says PMPs must adhere to regulatory laws, be subject to government oversight, follow airports’ administrative requirements, and be mindful of the public and employees who frequent airports. The ways in which airports are designed provide additional challenges. “Deterrent methods are limited when managing large open spaces,” Leone says. At Assured Environments, Leone conducts training in-house and in the field. Technicians who work on the company’s bird division team only perform bird control work. Weier says airport work often combines construction and pest control. “Exclusion is one of the primary tools in bird control, and that means you have to deal with building and modifying structures,” he says. PMPs may need special training on the equipment required to install control methods on buildings. They must also have a good understanding of the materials they’re dealing with — for instance, walls made of concrete or metal — and the tools needed to work with them. Understanding the target bird helps PMPs select appropriate control methods. Get to know the species’ flight patterns, eating and nesting habits, mating season and most of all, why they are attracted to the airport. As with general pest control customers, communication with bird control accounts is key. “We need to understand how customers’ equipment works to find the right solution, without interfering with the day-to-day workings at the airport,” Livingston says. Leone says he and his team work around their customers’ needs because airport schedules typically conflict with normal work schedules. Of course, PMPs cannot control bird species that are doing what they do best: flying the friendly skies. 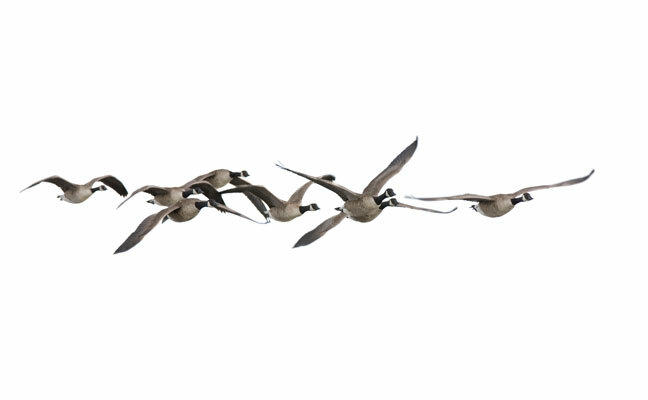 The Canada geese that caused the “Miracle on the Hudson” were flying at approximately 2,900 feet, according to scientists at the Smithsonian Institution who examined the feathers obtained from the downed plane. The Smithsonian Institution’s Feather Identification Lab analyzes feathers and conducts DNA tests on the remains from bird strikes. They estimated the geese weighed 8 pounds and were not native New Yorkers, but instead hailed from Labrador, Canada. Airports rely on bird control to protect passengers and airline personnel and minimize damage to aircraft. The solutions available to manage birds are almost as varied as the species themselves. To safely install solutions where birds are a problem, PMPs should be certified by the U.S. Occupational Safety and Health Administration (OSHA) to operate lifts and work on scaffolds.